Today’s class centered around a discussion of how immigrant and minority populations in London have either struggled or been able to assimilate. We examined specific groups and religions and attempted to define exactly what assimilation entails. Kelley brought up a great point about how some groups that come to London have no interest in assimilation. They come simply to get an education, make some money and share what they’ve learned once they return to their country of birth. This complicates the assimilation process even more. What can we do as educated young people to help minority groups achieve assimilation? Do they want our help at all? These are some questions I am going to continue to wrestle with for the remainder of my time in the U.K.
After class today I had an afternoon filled with art, both musical and visual. 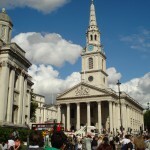 A lunchtime concert at historic St. Martin in the Fields featured a fantastic three man ensemble called E.L.F. Made up of a pianist Geoff Eales, french horn player Dave Lee and flautist Andy Findon the group put on an incredible performance highlighted by an extraordinary 40 minute take on Andrew Lloyd Webber’s “The Phantom of the Opera”. The music was moving and captivating throughout and at the end of “All I Ask of You” I was left with goosebumps from head to toe. As someone who played trumpet and a little bit of French Horn throughout high school I was amazed by the richness of the sound Mr. Lee produced. It was superior to anything I had ever heard performed in the past. The church’s incredible acoustics certainly had a major impact on the groups resounding sound as well turning a three man ensemble into what sounded like a full fledged orchestra. One action that took place during the concert that Brandon and I were pondering was whether it is customary for performers to exit the stage completely while the audience applauds and then return for the next number shortly after. We were unsure if this was something unique to England, unique to St. Martins in the Fields or whether the group chose to do so at their own discretion. In any event it was something we had never seen before. After the concert Aidan, Brandon and I headed over to the National Gallery where we gazed at thousands of works of art from all different countries and time periods. I do not know much about visual art and what techniques are used to make paintings considered great but I was continually amazed and impressed by the amount of detail these artists put into their work. Even the smallest stroke of a paintbrush can change a painting entirely. 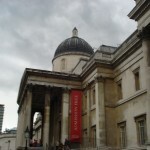 We spent a number of hours inside the National Gallery gazing at everything from Van Gogh to Manet to Van Brugh. Visual art is not my forte nor my specialty but I was very impressed and would go back to the museum in a heartbeat. 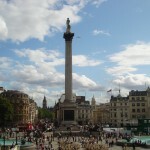 After our tour of the National Gallery we headed back out to Trafalgar Square. The rain had let up and the square was alive with all kinds of people. There was protesting, dancing, singing and any number of exciting things going on. 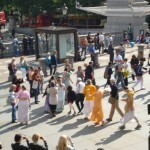 We took an abundance of pictures while in the area, attempting to catch all the excitement that was taking place as well as capturing the various monuments in the area such as Nelson’s Column and St. Martin in the Fields. The final stop in our afternoon included a tour of the National Portrait Gallery, just down the road from St. Martin in the Fields. Inside we viewed portraits of everyone from Princess Diana to T.S. Eliot. My favorite part of the portrait gallery was the section they featured on the Bloomsbury Group. Portraits of Virginia Woolf, E.M. Forster and Lytton Strachey just to name a few were found inside this area. After going on the Bloomsbury walk the day before with Professor Qualls the information was still fresh in my mind and I was able to make connections between the tour and the exhibit. This was fascinating. I can safely say that this has been my favorite day in London so far. A stimulating discussion, an unbelievable concert, a walk through an internationally recognized museum and time spent with friends adds up to a wonderful and busy day. I hope that the rest of our time spent in London will follow suit.